While the LA Phil manages the shows at the Bowl, the Los Angeles County Department of Parks and Recreation owns and operates the venue. 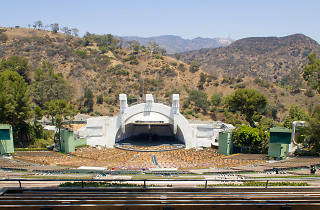 In other words: The Hollywood Bowl is sort-of a secret public park. The walk up to the Bowl is a borderline magical experience. Most of us tend to experience that stretch of Highland from our cars, where our traffic-induced survivalist instincts take over. But just steps from the road, you'll find yourself in a wooded sanctuary to the arts that's dazzled Angelenos since the 1920s. 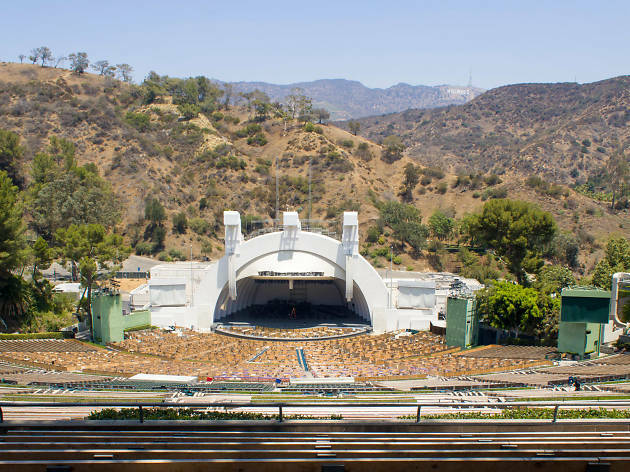 Many Angelenos may not realize they can explore the iconic amphitheater's shaded walkways and plazas for free on a typical afternoon, so the Hollywood Bowl has put together its own "Bowl Walk" itinerary to guide visitors. Check out the full map and itinerary here. You'll start your trek at the park's entrance by George Stanley's "Muse of Music," a WPA-era granite monument to the arts. Meander up the leafy Peppertree Lane and you'll encounter the Edmund D. Edelman Hollywood Bowl Museum. The educational space greets visitors with a rotating cast of exhibitions, mostly made up of old postcards, programs, photographers and posters. Admission to the musuem is free and the hours vary by day and time of year; make sure to check the Hollywood Bowl's website before you visit. Just past the plaza and box office, you can hug the side of the amphitheater and make your way through a thicket of sycamore pines and toward the top of the Bowl (if you're confused at all, Google Maps has a Street View walkthrough of the pathways). Feel free to stop at one of the many picnic spots along the way and enjoy the scenery. The Bowl prides itself as being the first amphitheater in California to be certified as an Audubon Society Cooperative Sanctuary; to you, that means it's a fantastic historical place to appreciate the flora and fauna of the Hollywood Hills. Hike all the way up the hill and from the back of the very last section you'll be able to catch a small glimpse of the Hollywood Sign. Feel free to poke your head inside of the seating area at any point on the walk; chances are you'll see some stair climbers working out or, if you're lucky, an open LA Phil rehearsal during the summer. Visiting the Hollywood Bowl Walk is a cinch during all but the Bowl's peak season (July through September). Occasionally the setup for a performance may limit access among the Bowl's grounds and walkways, while anything beyond the entrance plaza is limited to ticketholders during a show. You'll want to make sure to check the Hollywood Bowl calendar or give audience services a call (323-850-2000) to see if there are any park closures. The park hours are technically sunrise to sunset, but again, performances may limit your time in the area. Parking is free during the day in Lot B and Lot A, though it's limited to performance parking typically about four hours prior to showtime.